New York State’s Legislature has emerged as a central forum in the nationwide debate over “single-payer” health care. Discussion in Albany focuses on the proposed New York Health Act, which would establish a state-run, taxpayer-funded global health plan intended to replace all existing insurance, both public and private. First introduced in 1992 by Assembly Health Chairman Richard Gottfried, the legislation has passed the Assembly in each of the past four years and has broad support in the Senate’s newly installed Democratic majority. The legislation proposes to cover 100 percent of medical bills for 20 million New Yorkers—including 1.1 million who are currently uninsured—with zero copayments or deductibles, no limit on choice of providers and no need for advance approval of claims. In place of insurance premiums, which would be eliminated, this larger and more generous system would be financed through additional taxes collected by state government. Supporters insist the plan would reduce spending overall—and cost less than the status quo for all but a wealthy few—while still providing plenty of money for the state’s health-care system to flourish. It sounds too good to be true – because it is. In reality, the costs and risks of single-payer would be much greater, and the benefits much smaller, than its proponents claim. Sweeping and coercive even by international standards, the government-controlled plan would violate an ancient principle of medical treatment: First, do no harm. A system that covers more people and gets rid of existing cost controls—without slashing provider fees—would unavoidably drive health-care spending up, not down. 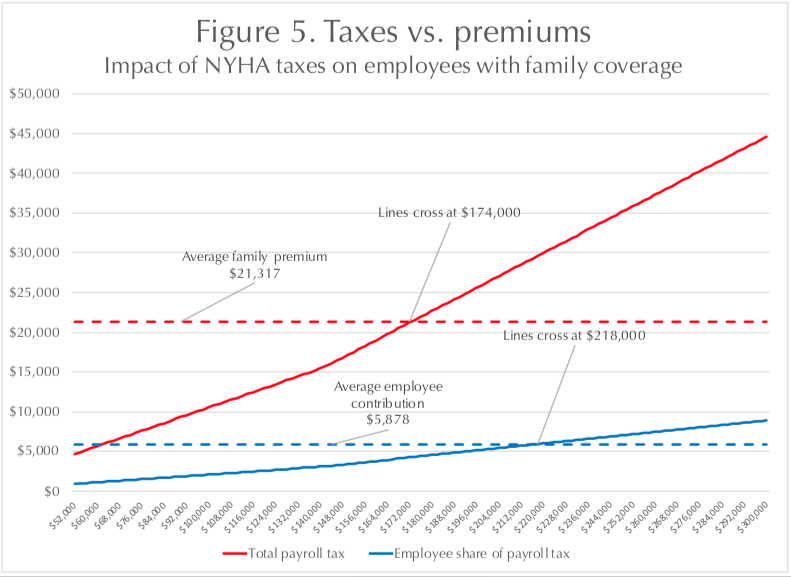 Given the exorbitant tax hikes required, a significant fraction of New Yorkers would pay more for coverage than they do now, and many if not most of those people would be low- or middle-income. Even if overall spending were kept stable, the switch to state-controlled prices would disrupt revenue flows for the entire health-care industry—representing almost one-fifth of the economy—with a destabilizing effect on access and quality. Meanwhile, single-payer would put vastly more power and money into the hands of a state government notoriously prone to corruption and inefficiency. Health care would dominate Albany’s time and money to the exclusion of other priorities, such as education and infrastructure. Ironically, the push for single-payer comes at a time when New York’s uninsured rate has dropped to a historic low of 6 percent. Many of the 1.1 million who still lack coverage would qualify for free or subsidized coverage under existing government programs. This means the vast majority of the money, effort and disruption required to implement single-payer would be devoted to people who already have insurance—and who would be forced to change it whether they want to or not. State lawmakers looking to improve the health-care system should focus on measured, practical solutions targeted at clear-cut needs—and not the costly and risky radical surgery of single-payer. The state-run plan would include no copayments, coinsurance or deductibles. Beneficiaries could seek care at providers of their choice without the need of referrals or prior authorizations. The plan would replace all existing forms of insurance, including the federal Medicare program for residents over 65 and the state-federal Medicaid program for the low-income and disabled. If the necessary federal waivers are not available, the state would provide “wraparound” coverage to supplement existing Medicare and Medicaid benefits. Funding for the new system would include what the state already spends on Medicaid, Child Health Plus and other programs, and, if possible, what the federal government spends on Medicaid and Medicare recipients in New York. It says payment would be on a fee-for-service basis at first, but authorizes the state to move toward “alternate payment methodologies, such as global or capitated payments” meant to enhance quality, efficiency and innovation. It also authorizes providers to organize for collective rate negotiation with the state. Providers would be barred from accepting additional payment for treating enrollees in the New York plan. Insurers would also be barred from offering any benefit covered by the state plan, effectively banning private insurance. Displaced insurance company employees would be eligible for state-funded retraining and job placement. The plan would be overseen by a 28-member board of trustees, to be appointed by the governor based on recommendations of various stakeholder groups and legislative leaders. The bill does not specify when the plan would take effect, leaving details of the implementation schedule to be determined by the health commissioner. The bill never came to the floor of the Senate, which had been under Republican control. However, it has wide support among Democrats who won a majority in the 2018 election. Implementing the New York Health Act would be enormously expensive for state government, but there is little consensus on its cost. Albany lacks a formal system for estimating the fiscal impact of proposed legislation, as is routine in Congress and some state legislatures. Moreover, the act lacks crucial details—such as tax rates, provider fees and cost-control methodologies—which makes precise forecasting impossible. Despite many unknowns, the bill’s supporters have nonetheless asserted that their plan would dramatically reduce health spending and save money for the vast majority of New Yorkers. An avowed supporter of the single-payer concept, Friedman projected that the New York Health Act would reduce the state’s overall health spending by $45 billion, or 16 percent. He further estimated the plan could be financed with combined tax hikes of $92 billion. That would represent more than doubling the state’s overall tax burden. Still, Friedman estimated that 98 percent of New Yorkers would save money compared to what they now pay for insurance premiums. However, Friedman’s analysis rested on dubious assumptions.11 He took for granted that the federal government would grant all necessary waivers, which the Trump administration has said it would deny. He further assumed state officials would successfully negotiate deep discounts on drugs, and that administrative savings would be greater than those forecast by other experts. A more skeptical analysis was produced by Avik Roy of the Foundation for Research on Equal Opportunity.12 In a May 2017 report, Roy predicted that medical fees and utilization would spiral upward, that administrative savings would be relatively small, and that federal waivers would be denied. He estimated that the plan would require combined tax hikes of $226 billion in the first year, roughly quadrupling the state’s overall tax receipts. The authors of the RAND report projected that overall health spending would stay roughly the same—dipping by 3 percent over the first 10 years—with the cost of expanded coverage and richer benefits roughly offsetting the savings on administration. Their estimated annual price tag would start at $139 billion in combined tax hikes—a 156 percent increase over the status quo. As the authors acknowledged, the RAND analysis relied on “highly uncertain” assumptions—for example, taking for granted that the state would receive federal waivers. Because RAND’s projections fall in the middle of a range of estimates, and because they are seen as non-partisan, they form the basis for much of analysis that follows—keeping in mind that the true costs could well be higher. Proponents of the New York Health Act contend that a single-payer plan would guarantee universal coverage and save money. In truth, neither outcome is certain—or even likely. Under single-payer, residents would still have to formally enroll to receive benefits. Experience shows many people will not sign up, even when the state offers them free or near-free coverage. For most of the past five years, the state has been actively encouraging as many people as possible to sign up for Medicaid, Child Health Plus or, since 2016, the Essential Plan. The first two programs charge no premiums and minimal cost-sharing, and the Essential Plan costs no more than $20 a month. Enrollment is available year-round, and the state spends millions on marketing the programs and helping people sign up. Yet the U.S. Census Bureau estimates 560,000 New Yorkers who are poor enough to qualify for these programs remain uninsured.14 That’s almost half of the state’s coverage gap. Some in that group may not want to accept public assistance. Others may not see a need to go through the paperwork until they get sick and need a doctor. Immigrants are a particularly challenging group. Some are eligible for coverage, and hundreds of thousands have enrolled in Medicaid or the Essential Plan. But others are ineligible because of their legal status, even under New York’s relatively broad rules. Others might be leery of sharing personal data with the government, for fear of drawing attention from immigration officials and being deported. Many would undoubtedly gain coverage under single-payer, but the state would continue to have a substantial uninsured population. Also doubtful is the expectation of dramatically lower spending. The main source of potential savings, as cited by proponents, is reduced paperwork and administration. The argument is that one big state-operated plan would operate more efficiently than dozens of private plans, each with their own staff, facilities, overhead and claims requirements. There would be fewer executive salaries and zero profit-taking. Providers would also save money on clerical work, because they would be dealing with one organization rather than many. The hole in this theory is that much of the private plans’ administrative spending holds down costs—whether by winnowing out fraud, reducing waste or encouraging prevention. Also serving as a brake on spending are the deductibles, copayments and coinsurance—which, for better or worse, cause people to think twice before seeking care, and which would go away under single-payer. The state would have to replace at least some of these private-sector functions with paperwork requirements of its own—if only to make sure that patients really exist and actually receive the service in question. Experts disagree about what the optimal level of administrative spending would be, but it’s not zero. That calculation is based on iffy assumptions—chief among them, that the state would efficiently manage this massive and unprecedented program, and that federal Medicare and Medicaid waivers would minimize the necessary administrative costs. The less-rosy view—reflected in studies of national single-payer plans by groups such as the Urban Institute17—is that simultaneously expanding coverage and removing the restraints of private insurance would result in higher spending, not lower. By any estimate, the New York Health Act would subject New Yorkers of all incomes to unprecedented levels of taxation. To raise the necessary funds, the legislation calls for two new taxes, one on payrolls and another on non-payroll income such as pensions, 401(k) withdrawals and investment returns. It specifies that both levies should be “progressively graduated”—with higher rates for higher incomes—and that the cost of the payroll tax should be shared, with employers paying 80 percent of the bill and employees contributing 20 percent. The bill does not give brackets and rates, instead calling for the governor to prepare a detailed revenue plan as part of his first budget proposal after passage. Under a hypothetical structure developed by RAND, the rates for both levies as of 2022 would range from just above 6 percent for the lowest income bracket to more than 18 percent for the highest bracket, as shown in Table 1 (below). The employee share of the payroll tax would equate to a 21 percent increase in income taxes for the lowest-paid workers, and 41 percent increase in the marginal rate for the top bracket. Factoring in the employer share, total state taxes on both payroll and non-payroll income would more than double at the low end and more than triple at the high end. 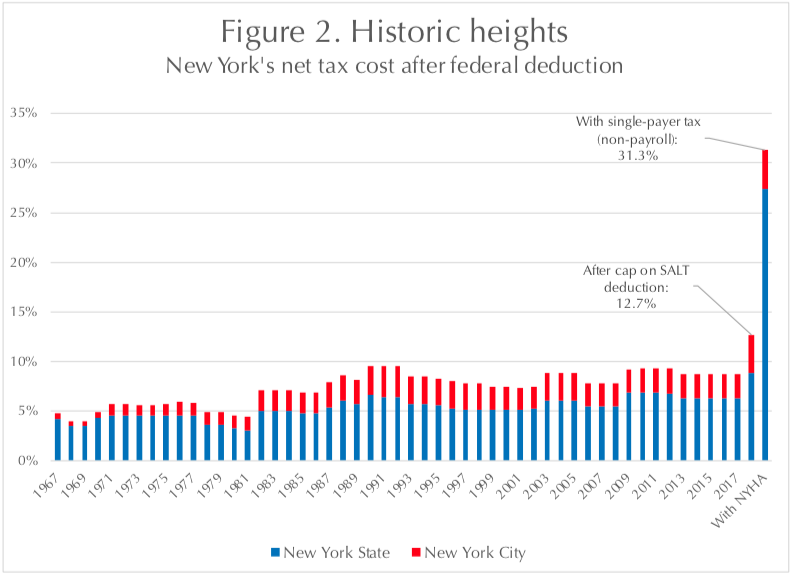 The scale of the resulting tax bite would be an outlier—both in comparison to other states, and by the standards of New York history. New York State’s top marginal income tax rate of 8.82 percent is currently the 10th highest in the country,19 but the combined state-local marginal rate in New York City, at 12.7 percent, is second only to California’s. 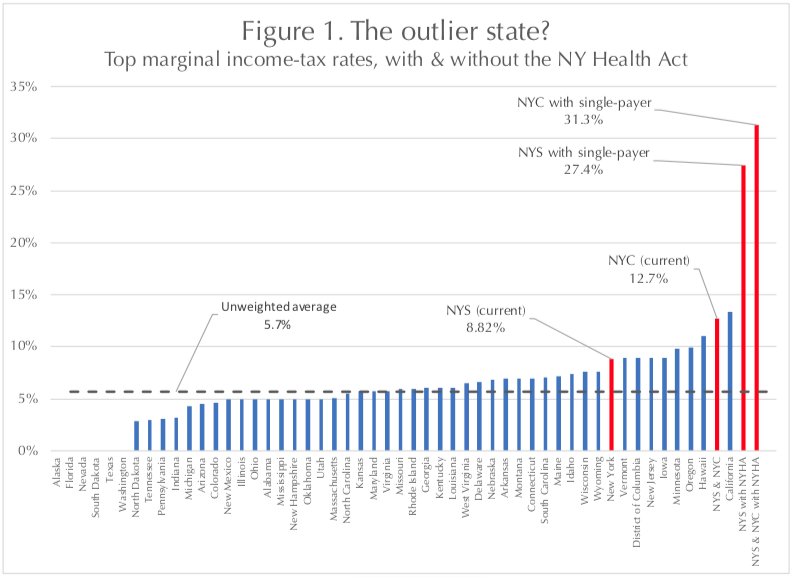 With the addition of single-payer taxes, the effective top rate on non-payroll income would vault to 27.4 percent for the state as a whole, and 31.3 percent in New York City—more than double California’s rate (Figure 1). Historically, the high-water mark of New York’s income tax was 15.375 percent in the late 1960s and 1970s, and the combined state-city rate peaked at just under 20 percent in 1976.20 At the time, state and local taxes could be claimed as a deduction against federal taxes, which reduced their net impact by more than half. Under the 2017 federal tax legislation, however, the deduction for state and local taxes (known as SALT) has been capped at $10,000 per year – meaning the highest-income taxpayers are now fully exposed to the state’s and city’s top marginal rates. The net impact of those taxes after deductions, which had hovered between 6.4 percent and 8.8 percent over the past 30 years, jumped to 12.7 percent when the SALT cap took effect in 2018.21 With enactment of the New York Health Act, the net impact could leap to 31 percent or more (Figure 2, below). This would dramatically increase the cost of living in New York for high-income individuals—who could lop 18 points from their marginal tax rate by moving to California, or 22 points by moving to New Jersey. Any such outmigration would undoubtedly have significant ripple effects. The top one percent of taxpayers are concentrated in the finance industry, a mainstay of the state’s economy, and they account for almost one-half of the state’s income tax revenues. The rough distribution of winners and losers is shown in Figure 3 (below), which reflects findings in the RAND report. 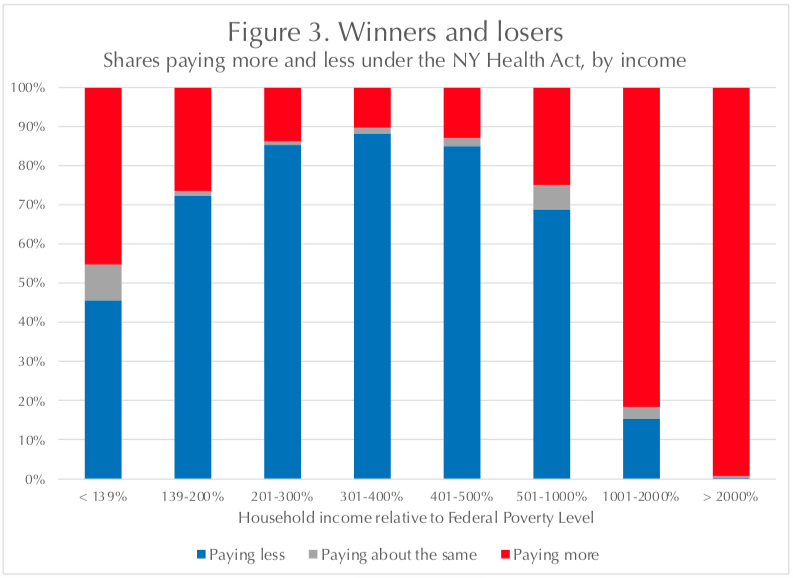 Using a projected Federal Poverty Level for 2022, it shows the vast majority of New Yorkers above 1,000 percent of the federal poverty level ($276,100 for family of four) would, indeed, pay more in single-payer taxes than they now pay in insurance premiums and out-of-pocket health costs. Also coming out behind are about 45 percent of those below 139 percent of poverty ($38,378 for a family of four), and 27 percent of those between 139 percent and 200 percent of poverty (up to $55,220 for a family of four). This is because virtually everyone in those income categories is eligible for free or nearly free coverage under Medicaid or the Essential Plan. Many of these people have jobs and would see a net loss if they were to pay even a small amount in additional taxes. Note, too, that smaller but significant shares of middle-income New Yorkers would also be in the red. For employees who file their taxes individually (Figure 4), the tipping point would be taxable incomes of about $78,000. Below that amount, employees would typically pay less in single-payer taxes than they now pay in single-coverage premiums; above that income level, the tax bite would typically outstrip premiums. For an employee who currently buys family coverage (Figure 5), the tipping point would be substantially higher, at about $218,000 in taxable income. Medicare premiums are generally lower, because the program is subsidized by the federal government. This is especially true when beneficiaries opt for Medicare Advantage, which is offered by private insurers and includes limited provider networks. There is typically no employer contribution toward the premium (except, in some cases, as a retirement benefit). Under single-payer, retired beneficiaries would pay 100 percent of the non-payroll tax, as opposed to 20 percent of the payroll tax. Under state tax rules, retirees owe no taxes on Social Security benefits and government-sponsored pensions, or on the first $20,000 of private pensions or withdrawals from 401(k)-style savings accounts. 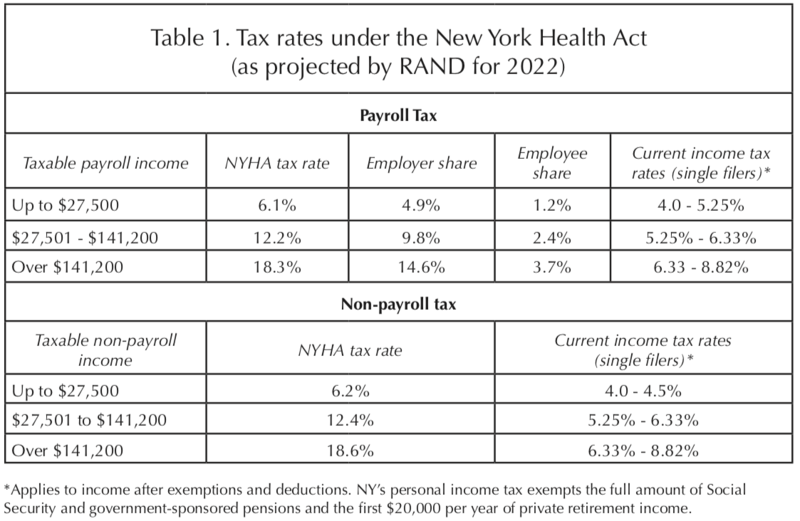 As seen in Figure 6 (below), for a beneficiary living in Brooklyn, the non-payroll tax (as projected by RAND) would exceed the premium cost of a typical Medicare Advantage plan at about $26,000 in taxable income.27 The tax would exceed the federal government’s estimated full annual cost of Medicare Advantage (including out-pocket spending) at about $48,000 in taxable income. It would surpass the full cost of regular Medicare coverage (Parts B and D and a comprehensive supplemental plan) at about $62,000 in taxable income. People with incomes above these various tipping points would have a financial incentive to leave the state—an incentive that gets bigger as income rises, which would erode the overall tax base. At the same time, people with incomes below those tipping points would have an incentive to move into the state, especially if they require expensive treatment, which would add to health costs. Of course, lawmakers would likely set the rates and brackets of the single-payer taxes at different levels than RAND projected. Indeed, Gottfried has said that he believes lower-income residents should be entirely exempt from the payroll tax, which would ease the negative impact on that group. This, however, would entail raising more revenue from the middle- and higher-income groups. It should be pointed out that single-payer taxes would likely have to increase over time, because medical costs have a long-term pattern of growing faster than the overall economy. RAND assumed cost growth would slow under a single-payer system, but still predicted the top payroll tax rate would rise from 18.3 percent in 2022 (projected as the plan’s first year of operation) to 20 percent by 2032. Although the New York Health Act offers few details about how providers would be reimbursed, there is certain to be significant disruption. Providers are currently paid a mix of rates by different health plans. Government-sponsored plans such as Medicaid and Medicare generally pay less, and private health plans generally pay more. Some providers are able to command higher private fees than others, either because of consumer demand or market leverage. Some providers also treat a larger share of privately-insured patients than others, and do better financially as a result. By its nature, a single-payer system would put all providers on a level playing field – which would significantly redistribute revenue, creating a mix of winners and losers. The industry would experience this disruption even if, as RAND projected, overall funding for providers was preserved at status quo levels. A recent analysis by the Empire Center and the Manhattan Institute29 gauged the impact on a core group of providers—hospitals—under two scenarios: a “Medicare for All” system in which hospitals are paid at Medicare levels for all patients, and a “spending-neutral” system in which Medicare fees are enhanced across the board to keep combined hospital funding at current levels. Under the “Medicare for All” scenario, combined hospital revenues would drop by about 17 percent, or $10 billion, and three out of four institutions would lose money. Under the spending-neutral scenario—with combined revenues held constant—two out of three hospitals would gain money. One in three would get less, and one in nine would stand to lose 15 percent or more of their revenue. Such a shift could, of course, improve the financial condition and quality of safety-net hospitals serving poorer neighborhoods. At the same time, it would have a negative effect on hospitals that would lose money—a list that would likely include many of the state’s most highly-regarded institutions. This redistribution could be expected to have a destabilizing effect not only on quality, but also access – as institutions facing financial losses are forced to downsize even as the insured population grows. Similar effects would be seen across the industry. For example, the most sought-after, best-paid physicians would potentially face a combination of lower income and sharply higher taxes, which might prompt them to leave the state. 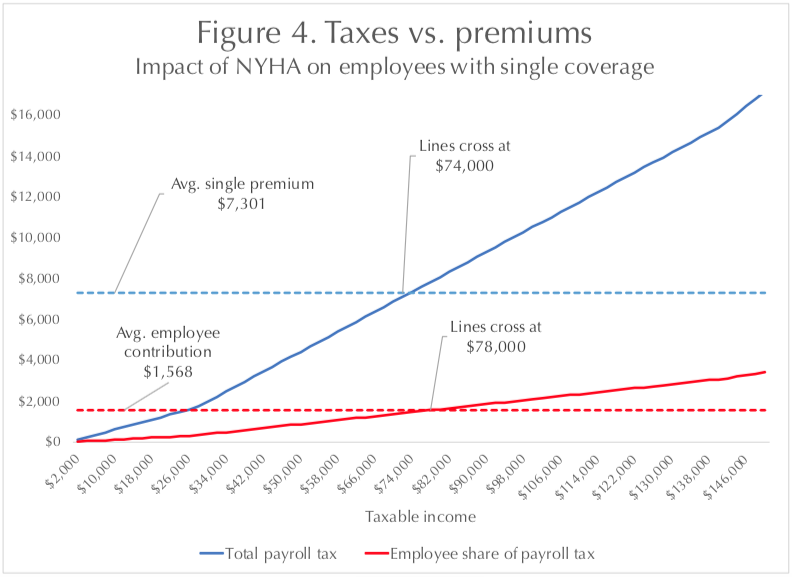 If administrative savings were shared with providers, the overall price tag for the New York Health Act—and the tax hikes needed to finance it would—would increase accordingly. Another ramification for providers would be a sharp increase in demand – as an additional 1 million New Yorkers gain coverage and many more are freed from cost-sharing and other insurance restrictions that may have deterred them from seeking care in the past. This influx would stretch the capacity of many providers, especially those that would also experience a loss of revenue. The all-encompassing single-payer plan envisioned by the New York Health Act would run afoul of federal law two major ways. First, the plan could not fully absorb Medicaid, which is jointly funded by the state and federal governments, or Medicare, which is entirely federal – without sweeping regulatory waivers from the federal government, major changes in federal law or both. It’s doubtful that Washington would cooperate, at least in the short term. The Trump administration has made clear that it has no interest in supporting such a plan in New York or any other state,31 and it’s unlikely that Congress – with Republicans controlling the Senate and Democrats in charge of the House – could agree on single-payer at any level. Alternatively, New York’s single-payer plan could serve as supplemental “wraparound” coverage for Medicaid and Medicare – by, for example, paying Medicare Part B premiums on behalf of beneficiaries, providing drug coverage in lieu of Part D and covering the cost of any deductibles. This is what the New York Health Act provides in the event that federal waivers are not available. This would significantly complicate the job of running the plan. For example, to continue receiving federal matching funds for Medicaid, the state would potentially need to annually verify the income eligibility of all enrollees in the state health plan, to determine who qualifies for federal Medicaid funding. However, those who refused to cooperate would still be entitled, as New York residents, to full coverage. The second legal obstacle concerns larger employers who have “self-insured” health plans, in which the company assumes the financial risk of its workers’ medical costs. These plans cover 4.5 million New Yorkers, or 56 percent of those with employer-sponsored insurance.32 Under the federal Employee Retirement Income Security Act, known as ERISA, states are barred from interfering in the operation of self-insured plans. A single-payer plan that supplants ERISA-protected plans and subjects their operators to a payroll tax would almost certainly be challenged in court, and could well be pared back or overturned. If the state were obliged to carve out ERISA plans, it would be losing a major fraction of its revenue and face additional administrative complexity. Under the New York Health Act, virtually all health spending in New York State—currently about $290 billion a year33—would become a line item in the state budget. Every other spending priority of the state—public schools, mass transit, roads and bridges, parks, environmental protection—would necessarily take a back seat. The state’s bureaucracy would balloon with a new army of health plan administrators. The health-care industry—which is already one of the state’s biggest spenders on lobbying and campaign donations—would likely pour even more money into Albany, creating an additional risk of corruption in a notoriously dysfunctional state Capitol. A mere 3 percent increase in health plan costs, which has been typical for medical inflation in recent years, would translate to a $9 billion deficit to be closed. Lawmakers would routinely face a choice between cutting benefits, reducing fees for hospitals and doctors or further hiking tax rates that would already be more than twice as high as those of any other state. At an absolute minimum, this would set the stage for a return of annual budget battles that once paralyzed state government for months at a time. Even as it upends the system for financing health care, the proposed single-payer plan would leave a flawed delivery system largely untouched. Indeed, many existing efforts to address fragmentation and waste would presumably be wiped away. 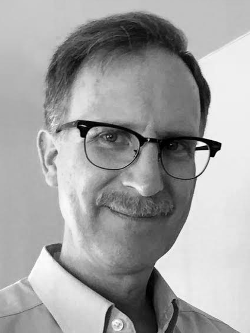 To encourage better collaboration among providers – and more emphasis on primary care and prevention – both public- and private-sector health plans have been moving toward “value-based payment,” in which providers receive a fixed annual payment for each insured person rather than being separately reimbursed for procedures and office visits. Some health plans also promote preventive measures—by, for example, notifying providers when patients are due for a mammogram or flu shot. The New York Health Act would effectively cancel these private-sector initiatives (because non-government health plans would be effectively banned) and leave public-sector efforts in limbo. However, most such methodologies depend on assigning each consumer to a group of providers, who are expected to share information and coordinate care. Many use “gatekeepers” to assure that consumers aren’t getting tests, drugs and procedures that are unnecessary or harmful. To start, however, the legislation specifies that the health plan would pay providers on a “fee for service” basis – a system that rewards volume rather than quality. It also specifies there would be no “prior authorization” of procedures. The bill memorandum, which presumably reflects the sponsors’ intent, further says there would be no “network restrictions” or “‘gatekeeper’ obstacles to care.” It’s unclear how value-based payment would work under those parameters. Also left uncertain—if the state is successful in supplanting Medicare—would be the fate of Medicare’s various quality improvement programs, such as rate penalties charged against hospitals with excessive readmission rates. The New York Health Act refers generally to the goal of improving quality, but does not include specific measures for doing so. As the sole payer of medical bills on behalf of 20 million New Yorkers, state government would be uniquely positioned to limit the growth of health-care costs through its price-setting power. It would ultimately determine all provider fees and gain additional leverage in negotiations with makers of prescription drugs and other medical supplies. At the same time, hospitals, doctors and other providers would be empowered to collectively bargain their reimbursement rates with state officials, and those groups have traditionally wielded considerable influence in Albany. How these conflicting forces would balance out is hard to forecast. However, the state’s previous attempt at price regulation in the health-care system raises warning flags. Shortly after that revelation, state lawmakers moved to deregulate hospital rates in the Health Care Reform Act of 1996. Since then, New York’s per capita hospital spending—though still higher than average—has moved closer to the national norm. A single-payer system would effectively reinstate NYPHRM-style rate-setting, not just for hospitals, but all providers—which could easily bring back the previous growth pattern. The unprecedented nature of the New York Health Act—and the many missing details about how it would work—make it difficult to predict economic effects with any certainty. However, the large tax hikes required—and the double-digit gap they would open between New York’s top marginal rate and those of other states – would create an obvious risk of slowing the economy and dampening job creation. Certain to be eliminated would be tens of thousands of jobs in the insurance industry. That would likely be offset to some extent by hiring by health-care providers in response to higher demand. With respect to the rest of the economy, RAND forecast a net increase in employment of about 2 percent, or about 160,000 jobs.39 This was based largely on a projected shift in disposable income from higher- to lower-income households, which typically spend a greater share of their disposable income on consumer goods and services. However, RAND specified that its job forecast did not factor in the economic effect of wealthy residents fleeing the state due to high tax rates. The New York Health Act is the equivalent of a multi-organ transplant—a desperate step that should only be taken when there are no alternatives. Single-payer would cut out major components of the existing health-care infrastructure—its systems for negotiating prices, paying claims, enrolling members, collecting premiums, settling disputes, policing fraud, improving quality and more—and replace them with new and different systems that have never been tried before. If the patient survives, it would be forever dependent on the machinery of a state government with a track record of dysfunction. Single payer is not only high-risk but enormously expensive, requiring massive tax hikes and heavy spending that would inevitably crowd out other priorities for state government. The vast majority of the expense would be devoted to imposing an alternative health plan on people who already have coverage. New York’s uninsured rate has dropped to a historic low, putting the state within reach of near-universal coverage. The achievability of that goal was recently highlighted by Mayor Bill de Blasio’s plan to guarantee health-care access to all residents.41 Building on the extensive services already provided by the New York City Health + Hospitals system, de Blasio’s plan is slated to cost just $100 million a year. Instead of contemplating radical, experimental surgery, state lawmakers should focus on health-care reforms that are measured, affordable and targeted to those who need the help. Liu et al, p. ix. Liu et al., p. 71. New York ranks behind California (13.3 percent), Hawaii (11.0 percent), Oregon (9.9 percent), Minnesota (9.85 percent), Iowa (8.98 percent), New Jersey (8.97 percent), and the District of Columbia and Vermont (tied at 8.95 percent). Liu et al., pp. 56-59. The 90 percent figure appears to be a misreading of the RAND report’s Figure B.3. The authors estimated, based on their hypothetical tax rates, that average health costs would be lower than the status quo for each of the bottom three income quartiles, and for those between the 75th and 90th percentiles. However, those averages include a mix of people who would be better off and worse off. Liu et al., pp. 89-91. Medicare premiums and annual cost estimates were taken from Medicare.gov’s Medicare Plan Finder. Results are for Brooklyn ZIP code 11201. Liu et al., p. 89. Liu et al., p. 30. Liu et al., p. 55. Liu et al., p. 42. Liu et al., p. 54. J. David Goodman, “De Blasio Unveils Health Care Plan for Undocumented and Low-Income New Yorkers,” The New York Times, Jan. 8, 2019.